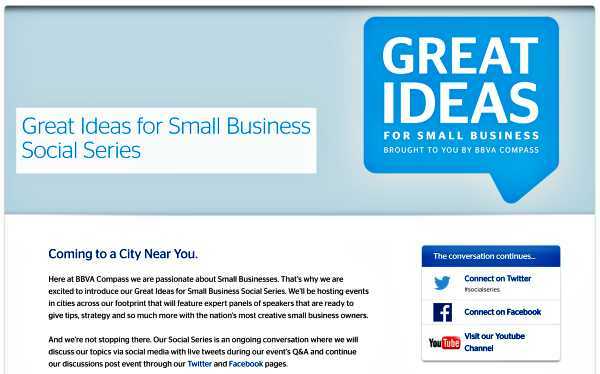 BBVA Compass launches its ‘great ideas for small business social series’ of events to help SMBs grow their business by meeting experts, networking with their peers, fully leveraging social media. BBVA Compass recently launched its Great Ideas for Small Business Social Series that aims to provide a platform for small business owners to learn, share and network with other entrepreneurs and also learn how to take their business forward from industry experts. Their event at the small business resource center Café Commerce in San Antonio offered the attendees an insight into the power of social media for small businesses and ways to access business capital. The event was marked by a presentation by the BBVA Compass Small Business Executive Director, Lonnie Hayes, on the current lending climate, loan application processes and the different financing options for small businesses. BBVA Compass Social Media Channel Manager Katie Gulas talked about the advantages of using social media for improving customer service and reaching out to potential clients. In addition, the bank shares the best practices and success strategies using popular social media platforms, including Facebook and twitter, on the Great Ideas for Small Business Social Series website during and after each of their events. This will allow entrepreneurs unable to attend the seminars to know what the industry experts are saying and will be able to ask questions to them. If you are interested in attending the BBVA Compass seminars, click here to register. BBVA Compass is the latest bank to spend some time and budget educating and empowering small businesses on how to navigate the difficult economic times and how to use social media and the likes of twitter and Facebook to drive customer advocacy.